Weatherford Fit specializes in the latest and greatest in person fitness gear, helping you get the edge to achieve your next big goal. 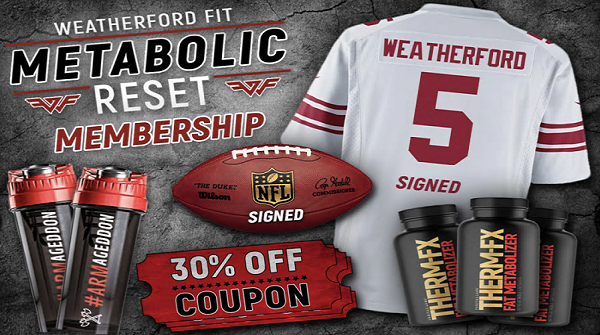 During this week, Weatherford5.com be giving away MASSIVE prizes including an autographed used football and Jersey from the New York Giants, FREE training programs, supplements, signed gear and more. There are over 50 prizes available and you can enter below — and each time you SHARE you get an additional 3 entries. You can also gain entries by referring friends, liking our social pages and more!